The vehicle's speed controller is used to vary the speed of an electric motor and it's direction. This OEM (Original Equipment Manufacturer) Speed Controller-ESCII-HD (Curtis 1205-117) is used on 1995-current E-Z-GO TXT, Shuttle 950 Series, XI-875/881 and Workhorse/MPT (Multi-Purpose Truck) 1000. 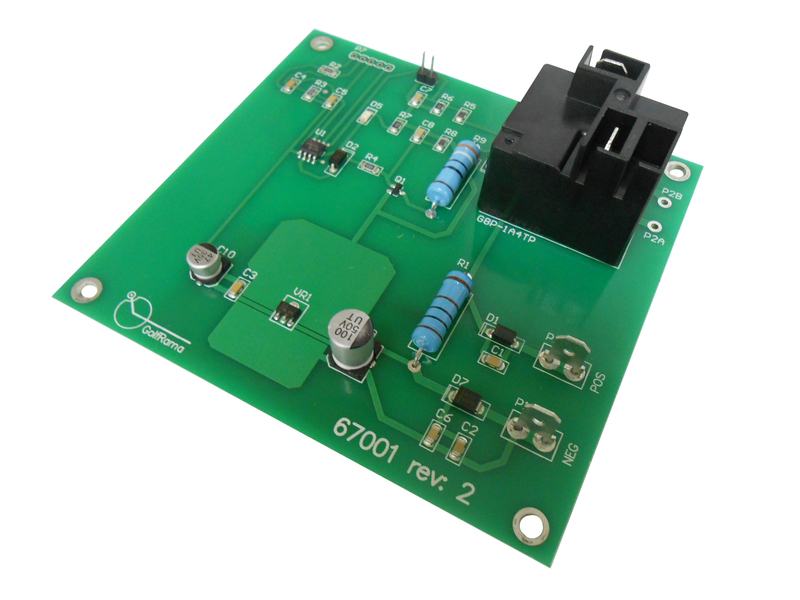 The Power Input Board is a module board used on Power wise II Chargers. 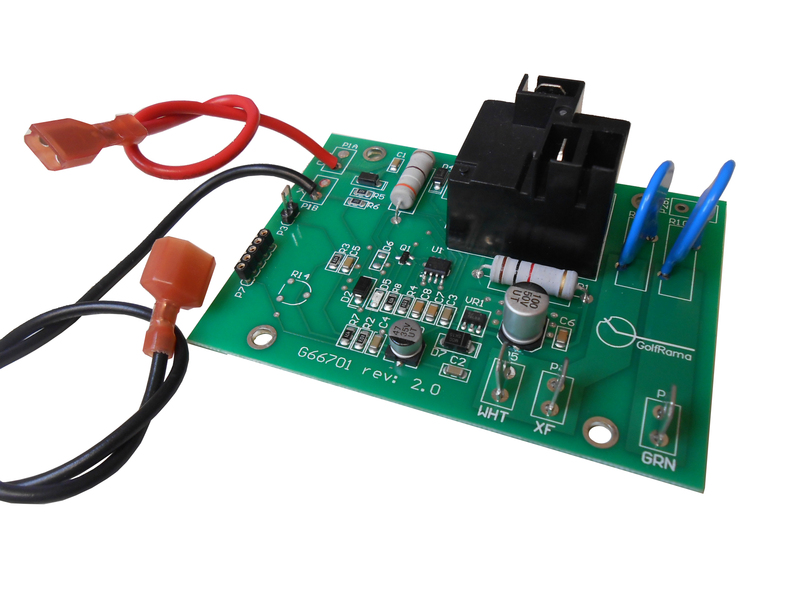 This board regulates the voltage level of the charger and has a built-in AC Detector that senses electrical current to detect the connection status of the circuit from the input board. •	Replaces both the control and power input boards. Q: My charger is overcharging my batteries. The charge rate is controlled by a control board located inside the charger case. If the charger won't stop charging when the batteries are fully charged, the control board is most likely faulty. This is usually caused by corrosion or bad connections in the charge plug handle. Open it up and inspect the connections. If you see a darkening of the terminals or corrosion, replace the contacts and tighten up the screws make sure you do not loose the magnet when you open the handle. It has to be in there to activate the switch on the golf cart that prevents it from running when it is being charged. Q: My batteries are completely dead, how do I get the charger to turn on? You need to charge the batteries individually with an automotive battery charger until they produce enough voltage for the charger to turn on. You can also use jumper cables to connect you battery pack with another golf cart of the same voltage. The current will pass from the other cart to yours and show the charger enough voltage to turn on. Q: The fuse is ok, the diodes are ok, and my charger still won't turn on. If the fuse is good, and the diodes check ok, and the batteries are not dead, the control board is probably faulty. If the charger clicks on but the meter does not show a charge, it may be the meter, but more likely, it is the capacitor. The capacitor is what turns down the charge rate as the batteries reach full charge. Q: My cords are cracked or frayed, can I fix them? Sure, just take them out of the case and cut the frayed portion off and re-install the proper terminals, replace the cord in the stress reliefs and re-install the cords. in the charger. Replacement cords are available here on the website. E-Z-GO Factory Part#: 19460G1, 27417G01 & 28567G0, now replaced by 28668G01. From 1988 through 1997 E-Z-GO offered a unique 'Total Charger II' that features push button start, LED read out of the battery voltage, time of charge and other cool functions. These special TC-II circuit boards are no longer available. Order this circuit board shown here but you also must call for a special wiring schematic to adapt this board to the 'Total Charger II'. This board will not support the lights, LED readout or push button start but it will salvage the charger. 1: These 'Total' chargers MUST be disconnected from the golf cart during any lengthy storage period...4 weeks or longer! The charger circuit board monitors the battery charge even when the timer is in the 'OFF' position. It will automatically come back on to charge if the battery voltage drops too low, but ONLY IF there is time left on the charger timer dial. Once the charger timer moves to the 'OFF' position it cannot come back on again unless you turn the timer to 'ON'. The charger uses the battery juice to monitor them. 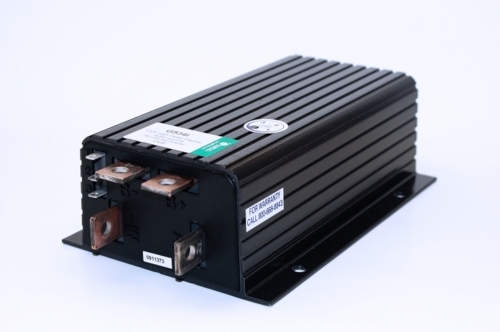 Over time the batteries discharge to such a degree that they will no longer power the golf car and, worse, the charger, when manually activated, will not come on to charge because the battery voltage has dropped below the critical 'cut-on voltage' designed into the system. The result is you come back to a golf car that doesn't run and can't be charged with your charger. 2: What to do if your batteries are so dead that the charger will not cut on? Assuming that the batteries have not frozen due to low specific gravity or that one battery is not totally bad, follow these recommendations. 1. Find an old style (pre-electronic circuit board) charger and use it to start the charge up. 15 minutes on one of these chargers usually brings the battery pack up enough to start using your regular charger again.